Jeff Schomay is a local panoramic photographer who’s unique images focus on natural and architectural spaces from his travels at home and around the world – but what makes them stand out is their creative use of distorted perspective. His goal is to find and reveal the unexpected, yet amazing perspectives of the world around us. 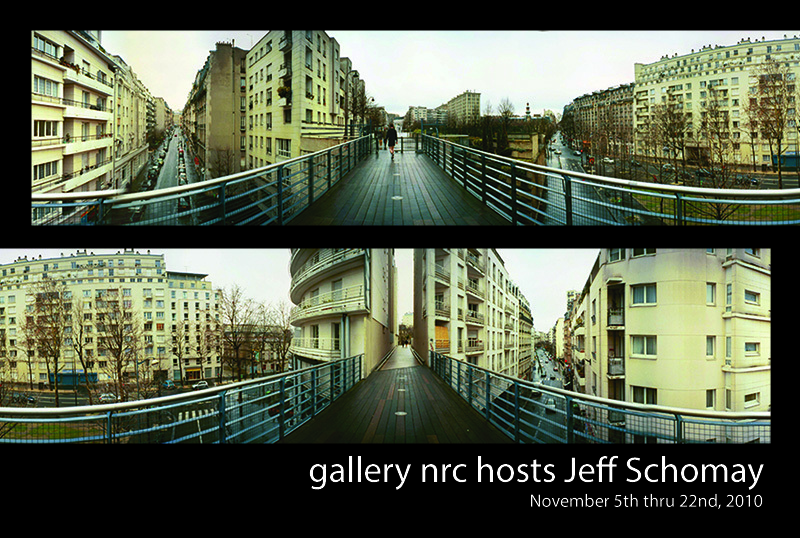 Jeff’s work will be at gallery nrc from November 5, 2010 thru November 21, 2010. “We don’t see the world as it is, we see it as we are.” My goal is to find and reveal unexpected, yet amazing perspectives of the world around us to share inspiration with my audience. So often, moments of beauty and awe go unnoticed. I believe that the right perspective can make even the ordinary extraordinary, and this is the perspective I try to capture and present in my photography. Most of my photographs come from my travels around the world. Traveling in new places always puts me in a unique state of mind, with a heightened sense of awe and wonder. I pick my subjects through a combination of spontaneous inspiration and calculated understanding of the psychology of perception. I then snap a series of carefully composed, overlapping photos, but I often have to wait until I return home before digitally stitching them together into one image, so sometimes it is a few months before I get to see if the whole piece actually turns out as I expect! I chose to use panoramic photography because by its nature it requires the viewer to adopt a new framing, but then I play with a creative use of distorted perspective to blend reality with a twist of the impossible to stretch the viewers’ minds and push their perspective. When people first pass by my work, but then stop to come back to look closer, tilting their heads and trying to figure out what they are really looking at, I know I have succeeded.